Established in 2014 as part of their Pollinator Monitoring Program, the MPG Ranch Butterfly Monitoring Program tracks butterfly populations using modified Pollard Transects, timed surveys, inventory trips, and opportunistic sightings. Changes in relative abundance of butterfly populations are analyzed in terms of habitat restoration efforts, land management practices, weather events, and climate. Methods and results will also be used to study how both survey design and butterfly detectability affect butterfly monitoring projects across the continent. This program offers opportunities for public outreach and encourages interaction between citizen scientists and professional biologists. Data Availability: Contact Jeff Pippen. Effort Tracking: All surveys are timed. 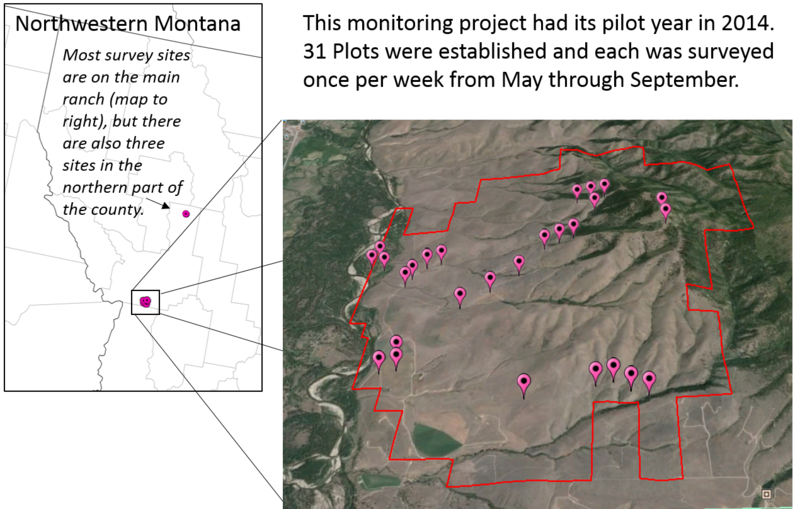 Protocol Notes: Seven Pollard Routes were established (three in north site, four on main ranch) in 2014 and expanded to 14 (four at north site and ten on main ranch) by 2015. These follow modified Pollard protocols. During 2014 only, twenty-four circular plots (50m diameter) [note, not 250m] were also established and were exhaustively searched biweekly using a serpentine Pollard Walk for seven minutes -- those surveys were repeated three times during each plot visit. All surveys ended during the 2016 season. In 2018, surveys were re-started on the north property.